1) prosperity and jobs, 2) conservation and the environment, and 3) community health, equity, and cultural vitality. 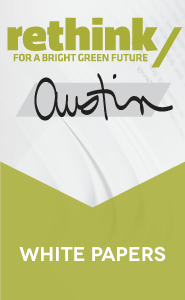 It means taking positive, proactive steps to protect Austin's quality of life now, and for future generations. Brief and advise Department Directors, the City Manager, Boards & Commissions, the Mayor and City Council regarding sustainability aspects of City policies, programs, and initiatives. Oversee and coordinate activities with departments that accomplish operational objectives sustainably, including green purchasing, energy conservation, solid waste recycling, green building, resource and water conservation, greenhouse gas reduction, and environmental reporting metrics. Manage the Climate Protection Program and related actions to reduce the City’s carbon footprint and be more resilient to the effects of climate change. This involves implementation of 28 building and Departmental Climate Protection Plans (which has resulted in a 75% reduction of greenhouse gas emissions since 2007). Offer educational outreach on conservation and sustainability initiatives to engage the community in making sustainability a priority – at home, at work, and all around town. 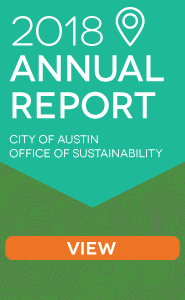 The Office of Sustainability seeks ways to inspire Austinites to take personal action for a bright, green future for our community. Promote partnerships and work with community members, organizations, and other government agencies to establish sustainability programs and practices.